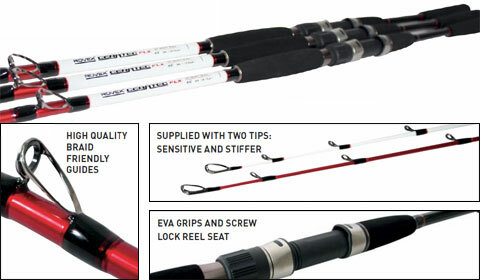 Ceratec DT boat rods are noticeably light and well balanced, offering high performance and value for any boat angler. Each rod has been constructed on a two-piece blank - equal length sections - and features two different tips so you can adapt to the conditions of the day. The first is a sensitive tip, for targeting specials such as bream and bass; the second tip is stiffer and more through actioned, to allow the use of heavier leads and lines when targeting deeper water and big fish.